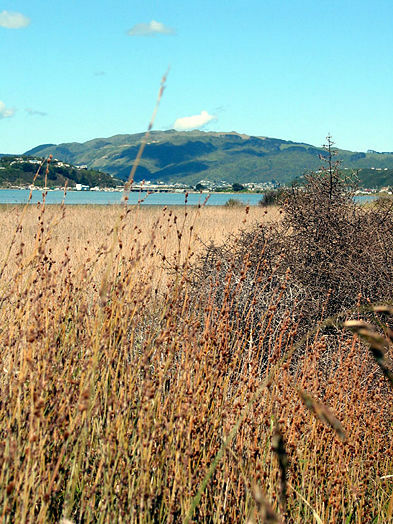 Colonial Knob is great afternoon’s walk through interesting vegetation, past pretty reservoirs, and with superb views of Porirua and the south west coast of the Wellington region. Whether approaching Porirua (on the SH1 Wellington motorway) from either the north or the south, take the Porirua exit, as if going to the Porirua shopping mall. Turn left on to Kenepuru Drive, and then take the fourth exit on your right into Raiha St.
A short distance further, turn left into Broken Hill Rd. Continue to the end of the industrialised section of this road, and you’ll see a small carpark for the Colonial Knob walkway on your right. With an extra couple of kilometres of walking, you can also reach the Colonial Knob start point by train. From Wellington central railway station, take the Paraparaunu line and get off at Kenepuru station. Trains run at least every half hour 7 days a week. See MetLink for more information. From the train station take the footbridge across the tracks and out on to Kenepuru Drive. Turn left and walk down Kenepuru Drive, until you reach Raiha St. Go up Raiha St, then turn left into Broken Hill Rd. Continue to the end of the industrialised section of this road, and you’ll see a small carpark for the Colonial Knob walkway on your right. The route we describe here is a simple up and down return journey, though a full loop is just as pleasant (see the options box). The walk begins from the Broken Hill carpark, where you head across the small footbridge, and snake around a short path until you enter Spicer Botanical Park. The park is worth taking a detour around at some point, as it contains interesting walks through themed areas of flora from around the world. 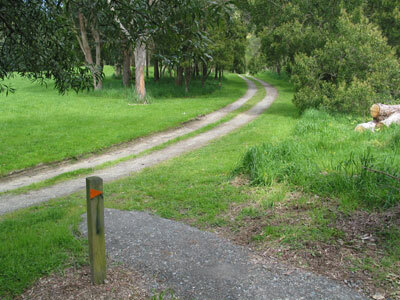 For now, just follow the ‘Australis’ walk and head down the gorgeous little 4wd roadway until it meets the exit to the Colonial Knob walkway on your right. A short way along this path, you can take a quick detour up to Reservoir 1 (to your right, twice). Originally built to supply water to Porirua Hospital (now redundant), the reservoir makes a very pretty and peaceful place to throw away all your working week worries. Return to where you began your detour, and continue up the Colonial Knob walkway. You will wind your way around the base of the hill, and then start to head up through some forest cover. You will pop out by a stile and on to a track which meanders up the hill across the farmland. Follow the green and yellow marker poles up the hillside, and soon after crossing another stile (and taking note of the ‘Dogs will be shot’ sign), you will reach the trig. There isn’t really anywhere to sit here (apart from on the the grass), but the views are stupendous, and can stretch from the Kaikouras to Mt Taranaki on a clear day. There’s also good views of Mana and Kapiti islands, not to mention all across Porirua. You will see that further down the track is the Airways Corporation radio station, which handles ground to air communications for the aeroplanes that frequently make their way down the Ngauranga valley flight path. At this point you can head back the way you came, or continue down the road, and loop back to the carpark (see the options box). You can turn this walk into a loop by continuing on past the Airways Communication station. Head down the 4WD road, and follow the marker poles and signs pointing to Broken Hill carpark. You will eventually need to exit the road to the right, and drop down a narrow track through the bush, back to the carpark. You should make sure you have a topo map if you intend to follow this circuit.